Find Utah Geek Magazine Issue 13 at your favorite local game stores, coffee shops, restaurants, and more! Click HERE for a list of all 170+ locations! Can’t wait for the new issue? Subscribe and be among the first to get your copy. So why aren’t PDFs available at the same time as print? 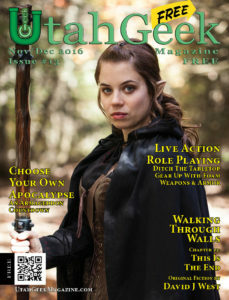 Utah Geek Magazine is first and foremost a free community print magazine. In order to keep true to our identity, we thought we’d encourage readers in the community to visit their friendly local game store, or any of our 170+ locations, and pick up a copy. That way, readers can read it the way it was meant to be read. If you can’t visit on of our locations, or can’t wait a month or so for the PDF, you can always subscribe here.